Knit and Natter sessions organised by Dorset’s Douch Family Funeral Directors for Preemies UK have become so popular that more groups are joining in. The funeral directors are the local co-ordinators for the not-for-profit organisation that aims to keep neonatal intensive care units across the country supplied with ‘tiny togs for tiny tots’. 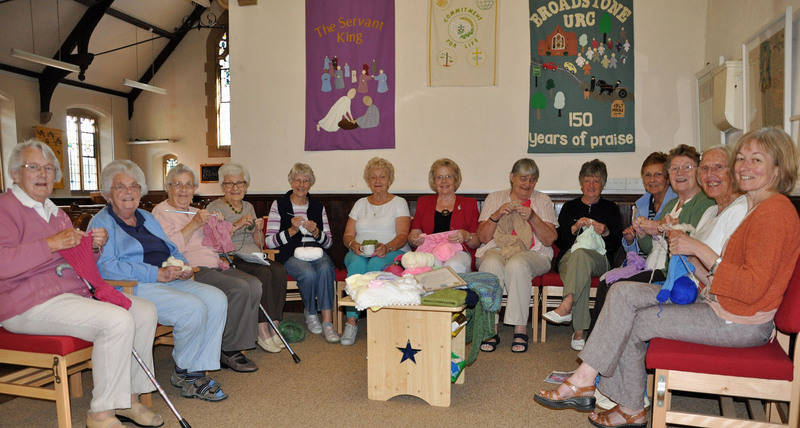 Knitters at the United Reformed Church in Broadstone meet every other Thursday between 9am and noon and now contribute to the neonatal units as well as continuing to knit for other causes. The Douch’s Parkstone branch, Ives & Shand has been running its own Knit and Natter sessions since February, which have now moved to bigger premises. The sessions, which are held on the last Thursday of the month between 10am and noon, have now moved to Belmont Court sheltered housing unit where there is a larger room. Another group has also started at Corfe Coffee in Corfe Mullen, which is being run by staff from Lesley Shand Funeral Service.. The sessions for Preemies are held on the first Thursday of the month from 10am to noon. All the groups would welcome new knitters and Douch Family Funeral Directors can provide wool and patterns. Nick Douch, Managing Director of the family group, said: “Our own knit and natter sessions have really taken off in Parkstone and we’re delighted that other groups are contributing. “Our links with the United Reformed Church in Broadstone and Corfe Coffee in Corfe Mullen have been strengthened and we pride ourselves in being a part of the community. “Since we became the local co-ordinator of Preemies UK we have sent off hundreds of items. The other branches in the group are Douch & Small in Wimborne, AE Jolliffe & Son in Ferndown, James Smith in Swanage, and Albert Marsh in Wareham and Upton. Premature infants require tiny knitted bonnets, booties, cardigans and blankets in order to keep warm. The babies find it very difficult, if not impossible, to maintain their body temperature so they need clothing that fits well and is designed to allow for wires and the constant monitoring that happens in neonatal units.